Check out Mathcounts, the best middle school competition math up to the national level. 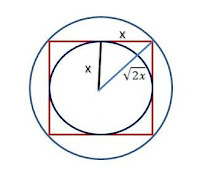 #1: A circle is circumscribed around a square and another circle is inscribed in the same square. 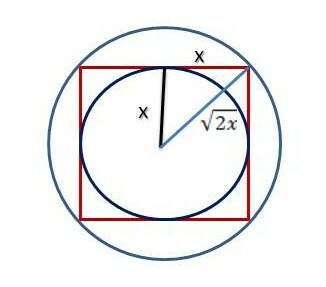 Find the ratio of the area of the smaller circle to the area of the larger circle. Express your answer as a common fraction. #2: A square pyramid has a base edge of 32 inches and an altitude of 1 foot. A square pyramid whose altitude is one-fourth of the original altitude is cut from the vertex. The volume of the remaining frustrum is what fractional part of the volume of the original pyramid? #3: This question is similar to one SAT question that most of my high school students have problem with. The two questions above are very similar. They are both related to dimension change, and appear very often on competition math. Just remember that for any two figures, the ratio of their areas is simply (ratio of base * ratio of height), and the ratio of their volumes is (ratio of base area * ratio of height). In cases where the ratio of all the sides are the same - that is, when you're dealing with similar figures - the ratio of the areas is just (ratio of side)22, whereas the ratio of the volumes is just (ratio of side)3. (1 over √ 2 )2 = 1/2. #2 : Since the two pyramids are similar, and you know that the height of the new smaller pyramid is 1/4 of the old height, the volume must be (1/4)3 = 1/64 of the original pyramid. So the volume of the frustum is (1-1/64) = 63/64 of the original shape. #3: Since the radius is a linear relationship. 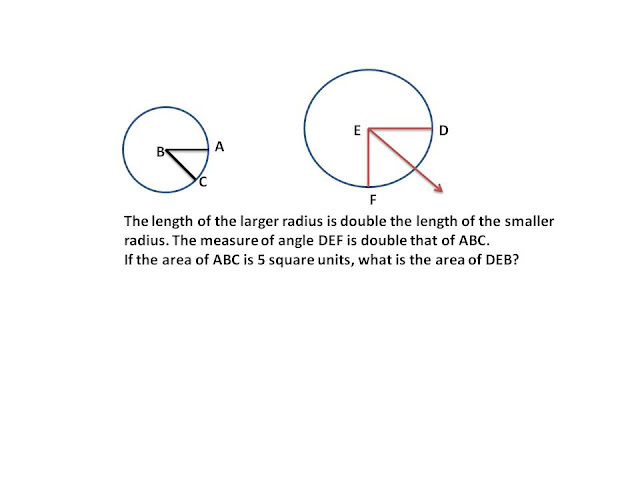 R1 to r2 = 1 : 2 (given), the area ratio is 1 : 4 (square both ratio)The larger measure is double the smaller one, so once you know the area of ABC, you can get the area of DEF by multiplying the area of ABC by 4 x 2 = 8 so 5 x 8 = 40 square units.